Hi loves! Today I am bringing you 4 gorgeous new shades from Glam Polish. They are part of the new 9 piece Knock-Out 2 collection featuring shades with a strong holo effect or ultra holo glitter finish. I have 2 of each to show you so let's dive right in! Aaaah, isn't that just mesmerizing ^^? Glam Polish BOING! 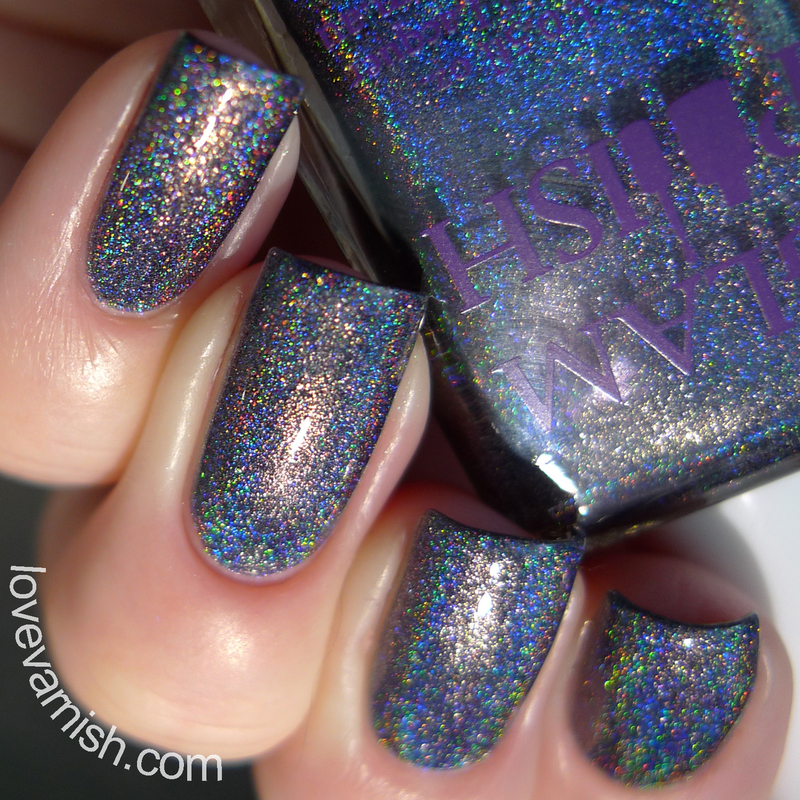 is a lilac holo with ultra holo glitter. I love how this isn't a too soft shade of lilac, it's definitely more colorful. 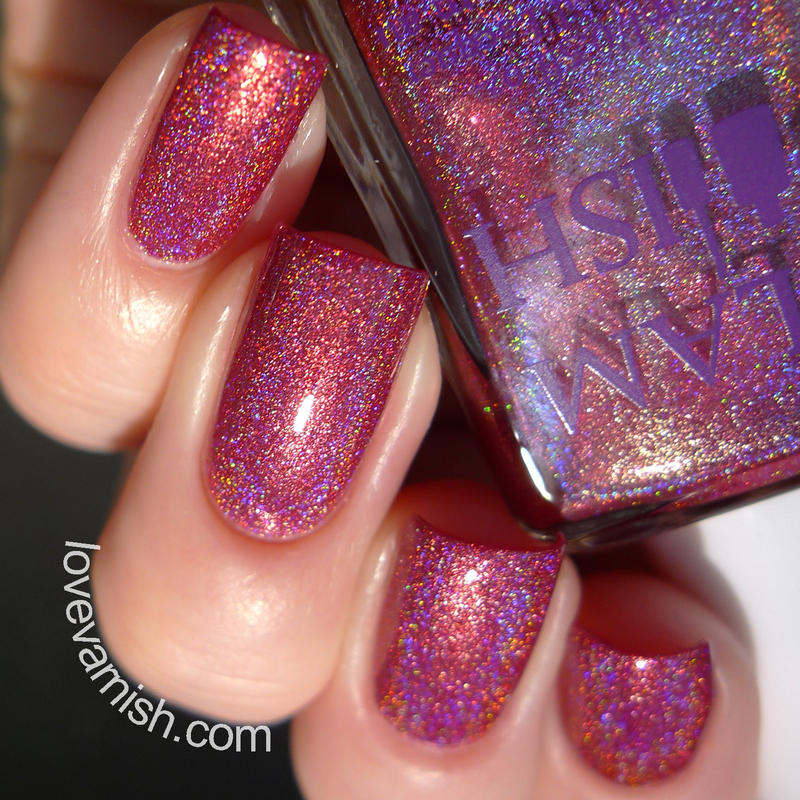 And that holo glitter.. so much sparkle! The formula was on the thin and sheer side so I used 3 coats to be sure of proper opacity. Finished with topcoat. Glam Polish POP! is a peach holo with ultra holo glitter. To me, this is a salmon pink shade. I don't really like it with my skintone but I think on someone a few shades deeper in tone it might look amazing. Again, very glittery and sparkly. The formula was more creamy and I only needed 2 coats. Finished with topcoat. Glam Polish SMASH! is a red ultra holo. Oh. Em. Gee. Such a beauty! I love how strong the holo is and the formula is great, just 2 coats needed. It applied so smoothly! Clean-up wasn't too bad though you might want to double on basecoat just to be sure it doesn't stain. Finished with topcoat. Glam Polish THWAAK! is a black ultra holo. To me, this isn't a true black, in my pictures it looks a bit blue and in reality it was more of a charcoal. I don't care, it's still stunning! Look at the holo flame - do you beg to differ? It's a bit more sheer so I used 3 coats, but because it's more sheer the holo pigment isn't dulled at all, so I don't mind that extra layer. Finished with topcoat. As usua;, Glam Polish releases a collection that has stunning shades in it. The formula, while a bit inconsistent, was always nice to work with and the colors are all wonderful. My favorites are BOING! and THWAAK!, especially the last one just because it is SO intense. What do you think of this new release? See anything you like? Tell me in the comments! These polishes will be released May 6th 6PM EST (AUS) from www.glampolish.com.au with shipping to Australia & USA. Shipping rates to USA are $3.50 USD for the first polish and an extra $1.00 for each additional polish. Glam Polish is also sold at various stockists, like Hypnotic Polish. For more information check the international stockists page. You can connect with Glam Polish through Facebook, Twitter and Instagram. Just like you predicted, I absolutely LOVE BOING haha! I'm so predictable.. I actually quite like POP on you! Well, I'm quite knocked-out by these beauties alright. Ohmygosh! your swatches are spectacular!! I almost didn't recognize Boing! love that it's showing more purple on you, on my skin tone it looks more of a pink lilac. Glam Polish heeft nog nooit wat uitgebracht wat ik niet mooi vind. Zo ontzettend jammer dat ik ze eigenlijk niet kan betalen ;-) Moet er hard voor sparen! Heb er nu twee en dit gaan er zeker meer worden. Vooral de laatste twee, zo moooi! I'm loving this collection! I need to pick up the 4 I'm missing! Holy smokes, these are damn pretty! POP! probably won't suit me, but I do love the other three. I still need to get my paws on part 1 of the knockout collection and I hope Hypnotic polish will restock them soon. I definitely prefer the ones without the glitter - They are prettier and smoother. Hahaha, that's why I love you :D! And thanks! Thanks so much Novita! Glad you enjoyed them :). Prachtige kleurtjes zijn het hè? Dank je wel! They are the coolest names :D! I'm a Lego games addict and the latest Batman release has an extra sound effect with all these sounds, like THWAAK and BOING, made me think of these polishes ;-). It's a great collection indeed! Did you end up grabbing these or the ones from Part 1? I think I like the finish on those best as well :).